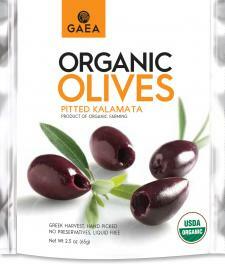 If you're a fan of olives and convenient, healthful snacks, you are sure to love Gaea's olive snack packs. Available in several varieties, these flavorful treats are ideal for munching on the go. Whether you're looking for items to include in healthy workday lunches or nutritious snacks to enjoy when you're on-the-go, these natural treats are a terrific and tasty option. These all-natural, preservative-free olives come in foil pouches that don't contain any liquid, so they are easy to eat wherever you are with no mess. That's one feature that makes them great for snacking in just about any setting, but the advantages don't stop there. The flavor variety is also a big plus. Whether you like plain black or green olives or if you enjoy olives marinated with zesty flavor, there is a snack pack to suit your taste. Each variety comes in a 2.5 ounce snack pack, and some flavors are available in a one-ounce size. As a review on Simple Side of Life points out, these packs are a convenient alternative for olive-lovers who might otherwise have to open a larger container of olives to separate into smaller portions when preparing meals to enjoy out of the house. If you're a savory snacker (I am! ), you'll love having tasty Gaea olive snack packs around. They are delicious, convenient, mess-free, and (of course!) olives are always a truly healthful snack option. Note: The author received samples of this product at no cost for review purposes. The opinions presented here are her own.